Took a long needed vacation and headed for Myrtle Beach. When I go on vacation I like to hit local places that are not touristy but show the local flavor and foods. I do break from this from time to time if there is a chain that I don't have in my area. 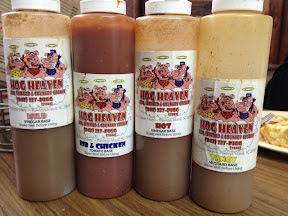 Anyway a twitter friend recommended I try Hog Heaven down in Pawleys Island. I planned one of our afternoons to of down and check it out and see Pawleys Island also. Hog Heaven is an unassuming building and you would probably miss it if you weren't looking for it. 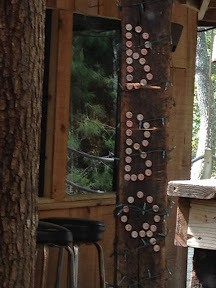 Not only do they have BBQ but they also have seafood. They feature a BBQ buffet and all you can eat seafood. Their prices are very reasonable. 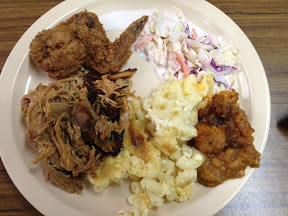 For my first and main plate I had slaw, mac and cheese, sweet potatoes, fried chicken and BBQ. The sweet potatoes were too sweet for my liking. The mac and cheese was baked and very good but we all agreed it needed a little something extra, maybe salt or a little garlic. The slaw - as I've said before I'm not a slaw fan - was great. It wasn't overly mayonnaised and had a great flavor. The fried chicken was awesome. Nice and crispy and very yummy. The BBQ was good. It was tender and flavorful. They smoke it low and slow but add some of their tangy sauce to it. I do wish they would serve it without the sauce so you can get an idea of what the meat tastes like. But even with the sauce it was good. They also have a dessert bar that has banana pudding and a cookies and cream type dessert. 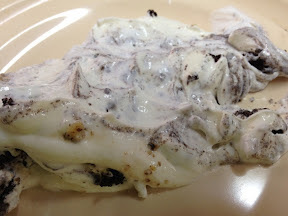 The cookies and cream dessert is very yummy. They offer four sauces; mild, rib & chicken, hot, and tangy. Each is good and enhance the meat. I was surprised they didn't have a Carolina mustard style sauce. The mild, hot, and tangy sauces are all vinegar based sauces and are quite tasty. The rib & chicken sauce is similar to your standard tomato based BBQ sauce and is a nice blend. 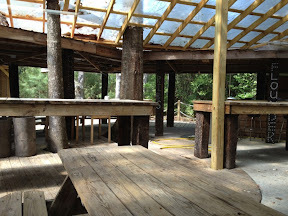 Hog Heaven also has an outdoor seating area. It would be a fun place to hang out with some friends and relax. After much debate with my family we have decided to give Hog Heaven a 3/4 rack of ribs on the Gibbs Ribs scale*. It is a place we will stop in again to eat at if we are in the area but not a place we would drive out of the way to go to. 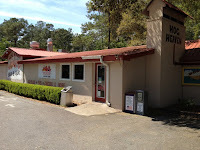 If you are on Pawely's Island or driving through and need a place to eat stop in here and enjoy the BBQ and southern country cooking.